Spring is coming, at least the last few days have reminded me so. Minnesotans are on the verge of insanity due to our extreme Winter, and, as much as we’d like to see the grass and the beginning growth of the garden, we have another month my friends…and then some. So why not release a new line of Spring Season cards to get us through the last few months of Winter? The Spring Onion is always the first glimpse of vegetable growth! The Fresh Dozen Set makes me ponder the idea of running a chicken coop in our backyard. I’m not headed to Florida like the rest of MN over Spring Break so the Citrus Set will have to do. And while some of us dream of warmer days, it’s time for the locals to get out of the house and socialize. 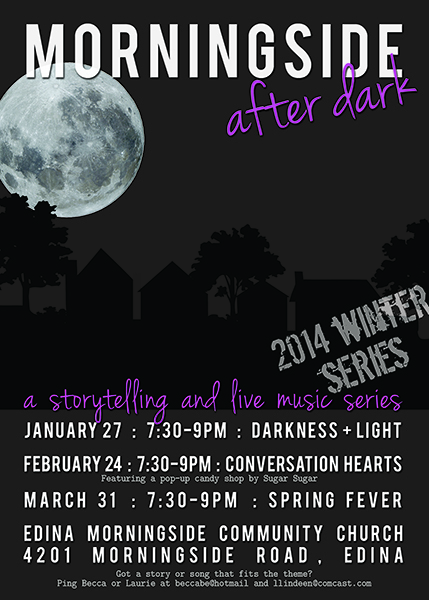 Why not join me in attending the Morningside After Dark Winter Series, a unique evening of storytelling and live music including highly talented musicians and writers. This month’s theme, Conversation Hearts, will be sure to warm up our souls! And Brown Ink Paper Goods will be on site, selling a variety of goods from the shop, as well as featuring a Postcard Project for all who attend. Come along and remember why writing can be a wonderful tool for continuing the conversation. We live in a world where communication occurs mostly through text, email and other forms of social media. However, when it comes to a condolence letter, a handwritten card is the only route to take. Coming from someone who enjoys writing, I find this particular card difficult, at times gut-wrenching and simply unnatural. I mean, where do I begin to summarize one’s life, how deep does one go, what words do I select, how can I be formal yet emotional in one card? This one is a toughie. He believes the act of writing a condolence letter forces you to take the time to select your thoughts and to share your compassion and stories. It took him three hours to write each one of his recent condolences letters and, after each letter, he felt better…”Not because by setting down words on paper, I had preserved something ephemeral, endangered. Emotions were pinned to the page like rare butterflies, no longer falling around indiscriminately, glimpsed only as they fluttered off, but preserved for future study.” This thought hit me the most. It’s not necessarily how perfectly you phrase your sentences, but by communicating through a letter what this mutual friend meant in your life, you two mourners are benefitting. Margaret Shepard, the author of The Art of the Handwritten Note, believes you should write a condolence letter even if you see this person often, the letter recognizes the importance of the event. She also feels it’s important to “be real” by using the name of the person and to not be afraid to use the word ‘death’. Shepard lists a few ‘Don’t Say’ phrases such as “I know how you feel” or “I don’t know what to say” and “You must be devastated” but I believe you cannot go wrong when the words are coming from your heart. Yesterday afternoon I found myself running down our snowy sidewalk in my socks. I usually prefer running shoes even in our balmy 22 degree weather but my heart made me do it. After missing our Postman’s pickup, I had no other option than to hand deliver the Valentine for my sidekick to the Postman’s mail truck. Love is in the air and at that particular moment there was nothing more important than making sure my postcard was in the mail on that day. The Postal Service also has reason to share this emotion. The USPS has recently announced The Love Letters Project, posting stories of individuals who owe a great deal of thanks to the Postal Service for a making love connection and drawing people together. Now through February 19th you can follow these stories through audio clips shared online. Make sure to take a listen to the other stories, all connected to letter writing through the Postal Service. But be warned, you just might be stirred to pen some sentiments of your own! Happy Valentine’s Day. There are those who write letters and there are the others…this is for the others. A spanking new company, Fountain Greetings, is all about the importance of a handwritten letter. So much so, they are willing to write one for you. All you need to select is the card and the words, the rest is taken care of. While using premium fountain pens, their staff of writers capture your words on the highest quality cotton and card stock from Terrapin Stationers. The elegant, cherry-on-top bonus is the wax stamp which seals the envelope. Brilliant! The cards take 1-4 days to reach the recipient, coming from New York City. That means for many of you, just in time for Friday’s holiday. 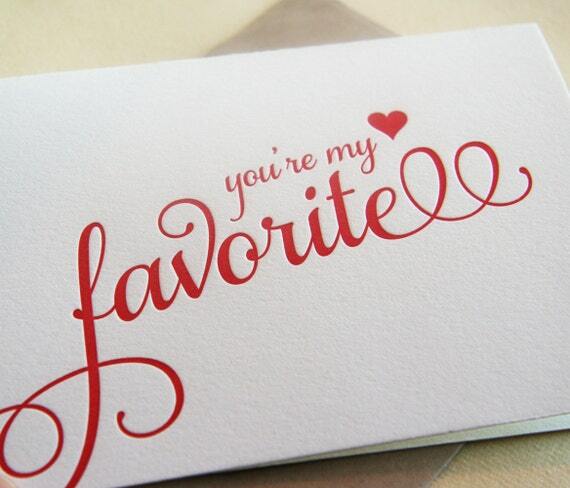 The I Love You and Hearts cards are just beautiful, especially being 50% off. So if you’re shy to share your handwriting but the words are bursting out of your heart wanting to be expressed, you no longer have an excuse. Go for it Romeo. Just another fabulous company staying true to the pen. Cheers to you Fountain Greetings! One week to go, still plenty of time to find or create the Valentine’s Day card that suits you and your sidekick best. Sycamore Street Press crosses their X’s and circles their O’s with this cheerful celebration of love created by hand with an intricate copper foil stamping. A good reminder to that person in your life you couldn’t live without, thanks to Steel Petal Press. When it comes down to it, it’s all about the simple heart. And Banquet Atelier & Workshop out of Vancouver has it nailed with their Neon Pink Heart Card, pure and simple. Who can resist an easy and free downloadable template when time is short? Camille Styles is here to save the day with the simple but tasteful printable cards! If you want to create a memorable Valentine’s card, place it in one of these fabulous dyed bags. 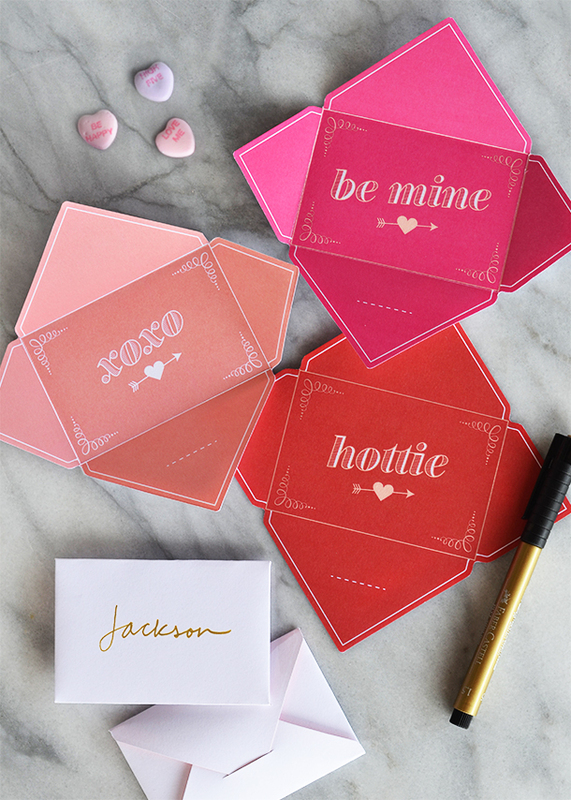 Oh So Beautiful Paper makes it look simple enough to create these beauties, used on Valentine’s and throughout the year! Here’s one for the romantic brought to us from Design Sponge; create a catalogue of love. Using library cards, replace the book numbers with important dates in your lives. Of course, these could always be handwritten vs. typed. The point is to collect the important moments in one location which will last for generations to come. We’ll have our Valentine’s selection and other featured goods waiting to be loved. Come swing by, fill your cup with bubbly, and let that beating heart be warmed on a chilly, sunny day.